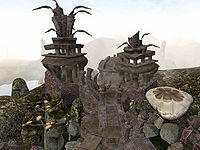 Yansirramus is an island shrine to Molag Bal southwest of Tel Aruhn. Molag Bal gives you a quest in this island shrine. The exterior of the shrine is guarded by a few leveled daedra and two Nord barbarians. 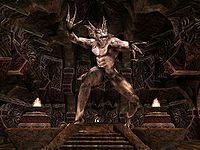 Upon entering the shrine, a few stairs lead to the main shrine chamber, which is guarded by a Dunmer mage and an Orc barbarian. The altar holds a silver longsword, some dreugh wax, a piece of raw ebony, and a cursed pearl. Behind the altar is a locked chest containing an assortment of random magical items, potions, and books. 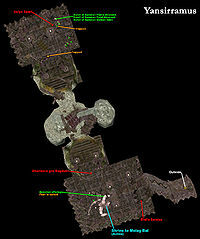 A hallway to the right of the shrine leads to a trapped door and a small living chamber guarded by a Dunmer sorcerer. To the left as you enter is a single bedroll and a set table. To the right are two crates and two urns, all filled with clutter. In the back right corner, however, is a table filled with loot. On the table are three summon scrolls, one golden saint, and one each of frost and flame atronachs. There are also three potions, a standard potion of silence, an exclusive restore magicka potion, and an exclusive magicka resistance potion, as well as a copy of Ancestors and the Dunmer. Next to the table is an urn filled with an assortment of magical scrolls, as well as a trapped and locked chest with a few random potions and books.